This large, traditionally furnished villa is situated on a plot of 7500m² in a quiet country setting near Algoz. 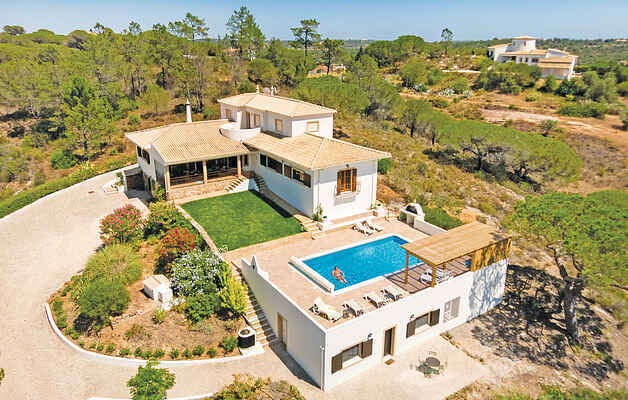 From the multiple terraces you have a breathtaking view over several valleys and the mountains of Monchique. Here you can enjoy the sun or the shade at any time of the day. It is an excellent location for hikers and birders, because you can actually start the nature walks from your own garden. Also the golfers are well catered for. At 5 km from the villa are 2 beautiful golf courses and only 10 km away is the golf course of Silves. The wide beaches of the seaside resort Armaçao de Pera are about 10 km away and there is a tennis court to rent within a 5 minute drive. Overall a great location with something for everyone! The costs of the large heatable swimming pool are not included.